Americans' economic health appears to be edging closer to code red as we head into the holiday season. A report released Thursday showed that the Consumer Distress Index fell sharply in the third quarter, indicating that more of us are falling behind financially. The quarterly analysis from nonprofit credit counseling agency CredAbility looks at five data points: housing prices, employment rates, credit usage, spending and net worth for the average U.S. household. The index grades economic health on a 100-point scale: Any rating below 70 signals distress. But the latest report showed the national number dropped to 66.7 from 69.2, reversing gains from earlier in the year. The deteriorating real estate market and the struggle to pay housing expenses, including mortgage payments, hurt the financial health of consumers nationwide in recent months, the index showed. Nor are homeowners alone: Renters too, are having trouble making their monthly payments. Adding pressure to household budgets is the rising cost of household goods, food and gas, which leaves Americans with little discretionary income. In nine states, including Texas, New Jersey and Pennsylvania, consumers slipped back into financial distress after several quarters at higher levels. Twenty states remain above the distress line, and consumers in North Dakota continue to have the strongest overall fiscal health. Nevada, which had the highest rate of new foreclosures in the last quarter, ranked as the only state at the emergency level for consumer health in the index. Other data also reflects the economic pain Americans are feeling: The number of mortgage holders who had missed two or more payments rose in the period ending in September, according to credit monitoring agency TransUnion. It also reported that the number of credit card holders who were past due on their bill by 90 days or more was also up slightly, although credit card delinquencies remain at an all-time low overall. 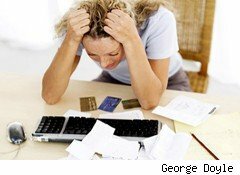 The distress index describes the sobering landscape shoppers face as they try to scrape together holiday budgets. "Unless consumers are willing to borrow, they'll need to scale back their holiday spending," said Mark Cole, chief operating officer of CredAbility.